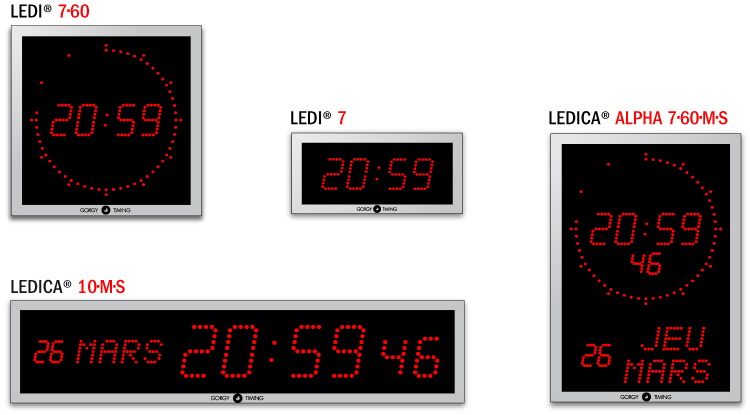 The LEDI® LEDICA® digital clocks for indoor and outdoor. The digital clocks LED LEDI® of ranges and LEDICA® in their standard version consist of a matt anodized aluminum casing, a front anti-reflective and bi-colored emitting diodes to display the time in red, green, amber or blue and white depending on the version chosen. Gorgy Timing LEDI® digital clock model has become a reference model for the time display. The famous clock LEDI® 6/60, iconic model in the range of clocks diodes Gorgy Timing, created in 1974 by Maurice Gorgy, has evolved over the years and has benefited from technological advances and innovation to become the model LEDI® 7.60 we know today. In many fields of applications, quality clocks LEDI® diodes refers for accuracy, clarity and strength. The LED digital clocks are appreciated for their direct reading of the hour. They allow their users a quick read and instant high accuracy. To meet the needs of its customers, Gorgy Timing offers its range of LED digital clocks for indoor and outdoor in different versions. All these LED digital clocks can be broken down into specific and customized versions. Download our LEDI® catalog Now ! Download our LEDI® World catalog Now !